Up to 30 electrical plug-in connectors per second, each of which entail any number of adjustable test features, and each error has to be detected with 100% assurance. Based in Jena, Germany, OTTO Vision Technology GmbH builds testing systems that meet such high-end demands. In doing so, it relies on machine vision cameras provided by SVS-VISTEK GmbH. The name OTTO Vision Technology GmbH reflects the core competence of the Jena-based company which was established by the two brothers Gunter and Reinhard Otto in 1992 as an engineering office: the two brothers wanted to inspect electrical plug-in connector parts during the production process using their own imaging software. Success came to them very quickly in this niche market. Very soon, however, they widened their range and sought to build fully integrated equipment. The demand for this kind of 100% quality control becomes even stronger considering the billions of connectors that are manufactured each year all over the world. Punching machines with speeds of up to 1,800 strokes a minute produce the connectors as punching strips which have to pass through the quality control systems. There, a wide range of geometric characteristics must be verified at a speed of up to 30 parts per second with typical tolerances of up to +/- 0.02 mm. Theoretically, a measurement precision of down to 1 µm is possible. To make matters more complicated, the connectors are highly reflective in unsuitable lighting conditions due to their metallic nature. This makes optical machine vision even more challenging. 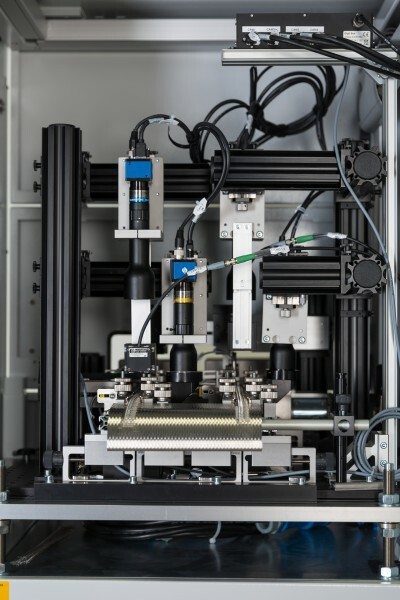 “Such speeds combined with the need to detect each and every faulty part with 100% reliability are possible only with very powerful quality control systems where mechanical elements, high-end imaging systems and evaluation software are fully integrated and work in perfect harmony,” explains Gunter Otto. The systems made by his company meet these requirements excellently. The impressive customer list speaks for itself and includes names such as Delphi Connection Systems, Diehl Metal Applikations, ERNI Elektroapparate, Inovan, Lear Corporation, Leopold Kostal, Patterer, Phoenix Feinbau, Scherdel Waldershof, Svoboda Stamping, TE Connectivity and Weidmüller Interface – as well as many others all around the world. “When we started building integrated testing equipment back in 2000, the tooling required for setting up new products was still very complicated,” Otto remembers. The two brothers concentrated on this aspect in the crisis year of 2009, shoring up their development department and coming up with an entirely new generation of software that focused on ergonomics and flexible configurability by the final customer. “Looking back, this proved to be a very wise step which continues to underpin our success,” explains Gunter Otto, describing the crucial decision made at that time. A PSS-40 testing station with dual-track technology and four cameras to simultaneously inspect two punched strips. At the beginning of 2017, OTTO Vision Technology launched its third-generation PSS-40 testing stations for punched strips. Compared to their predecessors, they feature optimized operator access and improved mechanical modularity. These systems come in three different widths from 550 to 970 mm and may be fitted with dual-track technology allowing two punched strips with the same or different connector types to be inspected simultaneously. 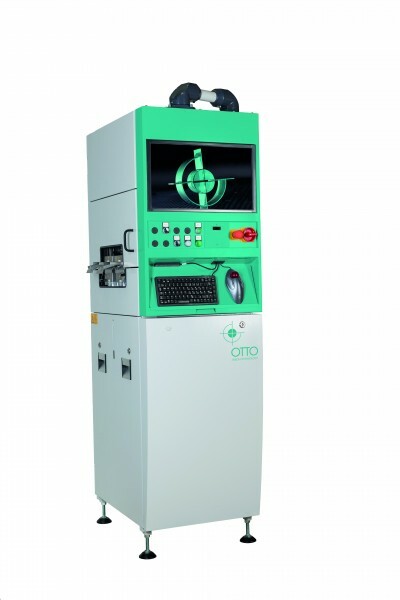 The smallest version of Otto Vision Technology’s PSS-40 punched strip testing station is only 550 mm wide. Depending on the model and the customer’s requirements, up to four SVS-Vistek EXO or EVO cameras with a resolution of 3, 5 or 8 megapixels are integrated in each testing station. According to Otto, the version with the highest resolution is used only in systems for testing larger items at a slower speed of around 20 items per second. With solid PC technology, image acquisition cards from Silicon Software or Euresys and suitable lenses, powerful imaging systems have been created meeting the challenging demands for punched strips inspection. 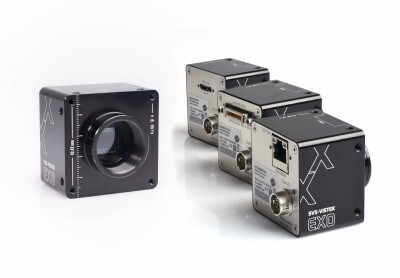 Apart from speed and resolution, Gunter Otto also mentions additional reasons for using EXO cameras: “These cameras feature an integrated four-channel flash controller providing up to 3 Amps of current which is used to control the lighting modules. The result is an economical, lean system design in terms of hardware and software.Time critical tasks are benefitting from direct communication of the camera I/Os with the PLC.” The possibility of choosing between GigE Vision and Camera Link interface was a one more reason for Gunter Otto to go with the EXO series cameras. A graduate in mathematics, he also likes the efficient driver design, which reduces the CPU load and makes high testing speeds possible in the first place. Otto Vision Technology relies on SVS-Vistek EXO and EVO cameras with a resolution of 3, 5 or 8 megapixels in its testing stations. Gunter Otto is focusing on two future trends: Until now, CMOS and CCD cameras have frequently been used in his company’s equipment. However, he thinks that it is only a question of time before imaging is based solely on CMOS cameras. Secondly, he has great expectations regarding 3D measuring technology. “We are already working on integrating 3D functions in our PSS-40 systems and implementing full 3D probes. Currently, capturing 3D point clouds is still proving to be a bottle neck but technology never stands still and we’re making good progress. The future definitely belongs to 3D measuring technology,” Otto believes. “Our software is already prepared for 3D measurement and we are already using it in hybrid form with 2D processes. I assume that our first systems with 3D probes will be rolled out in spring 2018.” At the same time, Gunter Otto is very confident that SVS-Vistek cameras will continue to be a key part of the next-generation systems for the comprehensive quality control of punched strips.